A Pilsen community group has filed a lawsuit alleging that a company looking to build a $30 million metal shredder across from a Pilsen high school improperly obtained its city permit. Last February, the city awarded a special use permit to Pure Metal Recycling. On Wednesday, Pilsen Alliance filed a lawsuit asking the city to revoke that permit. The suit alleges that in order to obtain that zoning permit, former Pure Metal president Mark Swedlow deliberately misrepresented a connection between Pure Metal and Acme Refining, a Bridgeport metal refinery. The lawsuit states the connection between the two companies should disqualify the shredder from receiving a permit. Acme Refining was raided by agents from the Internal Revenue Service's Criminal Investigation Division in August 2013. Swedlow has long denied a connection between the two companies. However Brett Baron, a former principal in Acme and son of its president, is now the president of Pure Metal Recycling. In October Acme Refining was bought by longtime scrap industry executive Chris Dandrow and renamed Pure Metal Recycling. Dandrow is now owner and acting CEO of Pure Metal Recycling. Alderman Danny Solis (25th Ward) has supported the shredder despite push back from several community organizations. In a press release, Pilsen Alliance also points to contributions from Pure Metal stakeholders to previous Solis campaigns. Swedlow contributed $6,500 to Solis in 2011, according to state records. The heads of Scrap Metal Services—Pure Metal Recycling's former partner—donated $10,000 to Solis that same year. 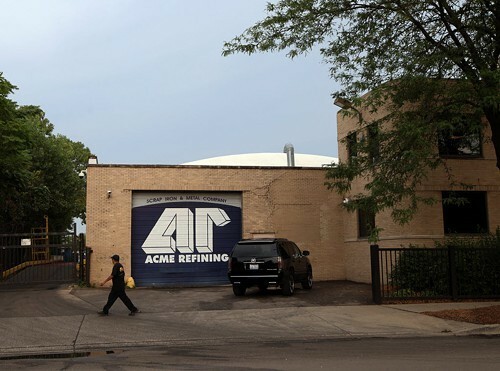 In 2013, the Chicago Sun-Times reported that Acme Refining contributed a total of $32,500 to the 25th Ward Regular Democratic Organization, led by Solis. A spokesman for Pure Metal Recycling pointed out that Pilsen Alliance's lawsuit was jointly filed by the community organization and SIMS Metal Management, a company that operates an existing metal shredder in Pilsen.